An earthquake of a magnitude of 7.9 hit Sichuan, China on May 12, with its epicenter about 50 miles northwest of Chengdu, the capital of Sichuan. According to the latest news reports, authorities fear that as many as 50,000 people could have lost their lives. 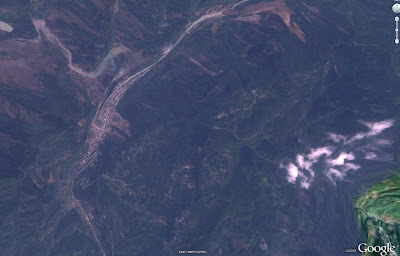 We now have post-earthquake imagery from our satellite providers; as of this morning, we have processed the first set of satellite imagery from Formosat2. You can see the imagery by downloading this KML into Google Earth. We will keep updating the KML as we receive and process more satellite imagery. Save the KML to your "My Places" to see the imagery updates. The first scenes captured the rescue effort to assess and repair dam damage near Dujiangyan City (北川上游围堰) after the quake. Special thanks to NSPO, Taiwan's national space agency, for their quick action and providing imagery. To refresh the content, right click on the layer name and choose "Refresh".